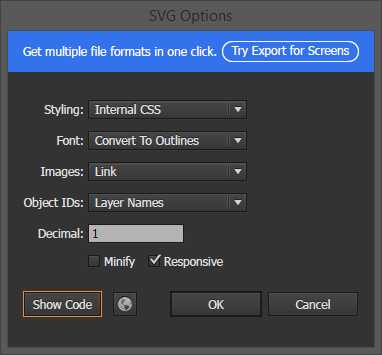 When you begin working with SVG, it is important to understand how to create, export, and optimize your SVG files for the browsers that will render them. However, before we start, you need to understand one thing clearly. 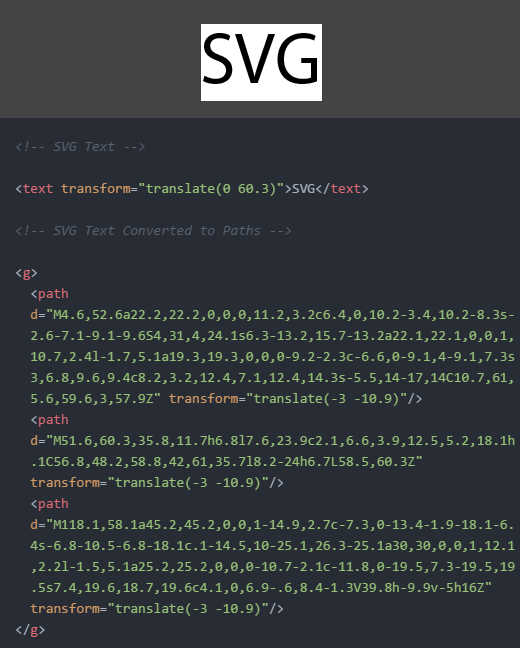 The optimization of an SVG file begins with its creation and continues all the way to export. Like any HTML web page, it’s difficult to fix a poorly built SVG file after it’s completed. 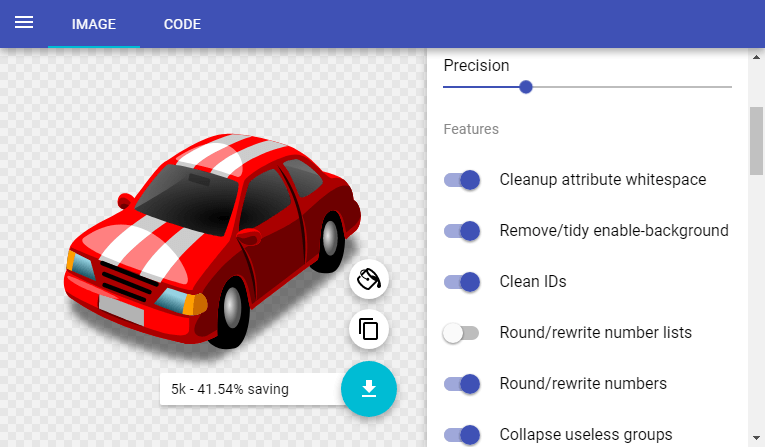 Sure, you can use optimization tools after export, but this automated approach can break your file in all kinds of unexpected ways. 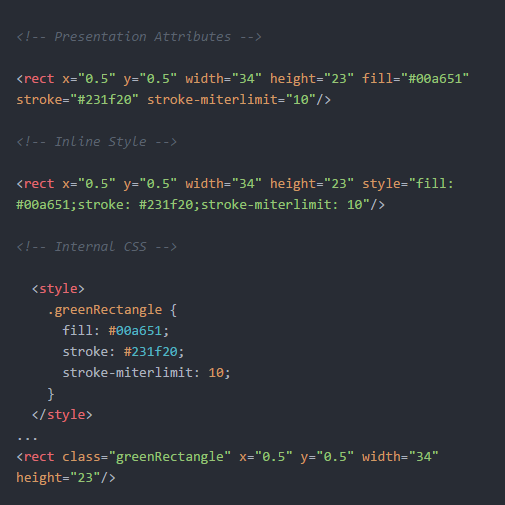 Having a solid working knowledge of good manual SVG optimization concepts will hold you in good stead from the start. This is exactly what you will learn today. When you create a graphic in Illustrator—which is intended for SVG export—you need to perform some steps and considerations required to make the final output properly optimized for web. Let’s explore them now. Illustrator — as most vector illustration software — was originally designed for print production, and therefore its color space is set to CMYK by default. RGB is much more appropriate for web and screen use, and has a wider gamut (range of colors) than CMYK. So, when you create new document, make sure the color mode is set to RGB – as you can see in the image below. 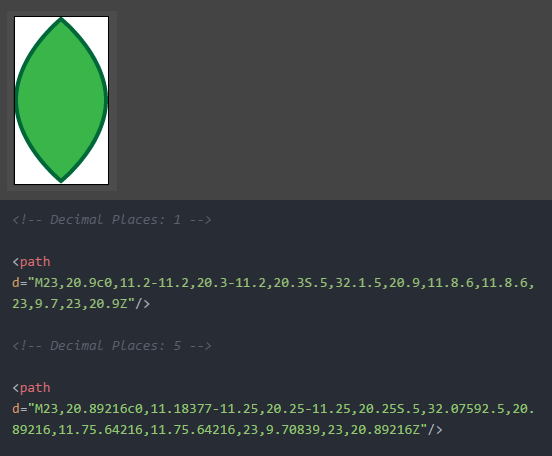 An SVG file is not like a regular bitmap image — a grid of pixels. It’s a text document that has a specific structure. Like an HTML document, you can select and manipulate individual elements separately. To do this, you’ll need to use their names as a reference. 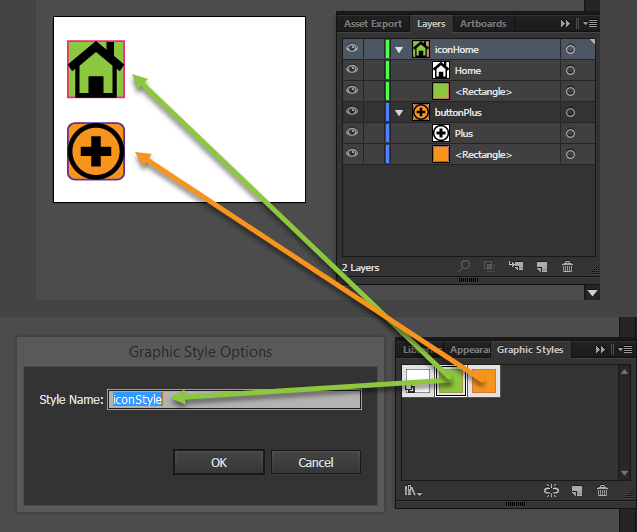 I’ve found it’s always much easier to create these labels during visual editing in Illustrator, rather than later. In the images below, you can see in action how names from an Illustrator file reflect to the exported SVG. The shapes in an SVG drawing are described with coordinate points. The more points a drawing has, the larger the file size and more difficult it is to edit and maintain. Creating small, efficient files makes your life easier later. To solve this issues, you need to use the fewest possible number of points to create the shapes you need. This can be achieved in several ways. Using simple elements like line, rect, and circle has some significant advantages. 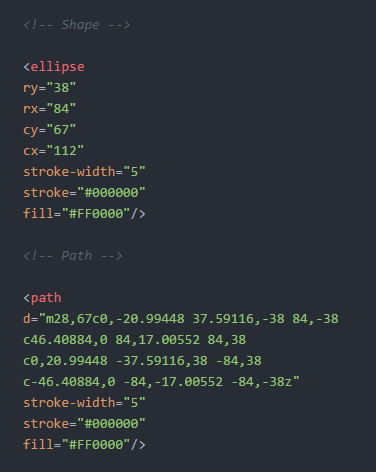 Firstly, simple shapes are much more readable for humans – it’s self-evident that a circle is a circle when we see it in our SVG code, but the code for a path can be anything until we see it render. Secondly, simple shapes almost always produce smaller file sizes and less code, which make them easier for maintain and edit. You can also control them more easily with their direct attributes such as x, y, cx, cy, instead of point coordinates as it is with paths. To see what I mean, in the image below you can see a simple circular shape defined once as a SVG circle element and once as a SVG path. Though they render identically, it’s clear that the SVG shape is smaller and more versatile. Be aware that some graphics editors – Fireworks’s SVG export extension was an example – automatically convert SVG shapes to paths when you export. Obviously, try hard to avoid this. A path is nothing more than an array of coordinate points. To simplify a path means to cut out some of its points, which will lead to less path data and smaller file size. To do so you can use Object > Path > Simplify… command or Warp Tool. In both cases, the main point is to reduce the path’s points maximally without loosing the quality of visual appearance. In the images below, you can see how Illustrator’s simplify process reduces path points from 32 to 23 — which is about 25% — and how this reflects to the code. The path data is decreased while the visual quality still remains at a good level. In SVG graphics, text is a standalone element and as such it is searchable, accessible, and easily re-editable. This is a valuable quality for text to have. However, if you want to guarantee your text looks exactly the way you designed it everywhere, your end-user will need to have access to the correct fonts. This means choosing a common fonts — which limits your creativity — or providing a web font. 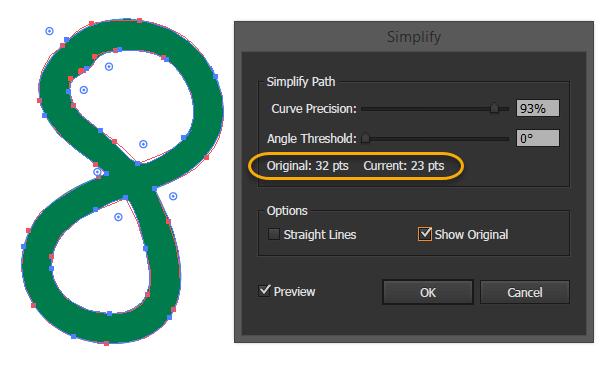 If precise text rendering is more important than editability — for example, in a logo — you can convert it into paths by using Type > Create Outlines command or by setting this option in the export panel as you’ll see later on. Bear in mind that convert a lot of text to paths, the file size can increase drastically – so think carefully before converting. Illustrator offers a set of SVG Filters that are applied live in the browser (Effect > SVG Filters). While Illustrator or Photoshop Effects are always permanently ‘baked into’ your raster images embedded inside the SVG, SVG filters can be changed or removed at any time with a few keystrokes. 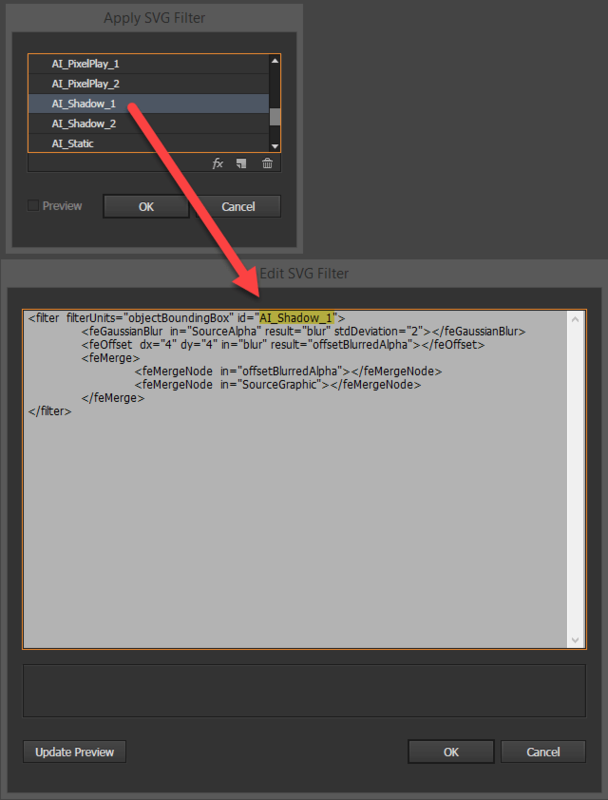 You can also create re-usable filters and/or edit them via Apply SVG Filter dialog. If you want your SVG to be displayed predictably, it’s good habit to always to trim your artboard to the drawing before. The artboard dimensions are the dimensions of the exported SVG viewport, and any white space in the artboard will be generated as white space inside the viewport. Depending on situation you can use Object > Artboards > Fit to Artwork Bounds or Object > Artboards > Fit to Selected Art command. In the image below, the left star will be exported with the surrounding white space, while the right star will be exported with its proper dimensions. Since version 2015.2, Illustrator CC has shipped with a new export panel created for web-optimized SVG files. In this section we’ll see how to use it. Note: For those of you using older version of Illustrator here is an appropriate tutorial. Let’s explore the options presented in more detail. There are three way to style your SVG and they are presented in the first dropdown list. The first is to use internal CSS (i.e. a <style> block), which is generally considered the best option following the Separation of Concerns principle. 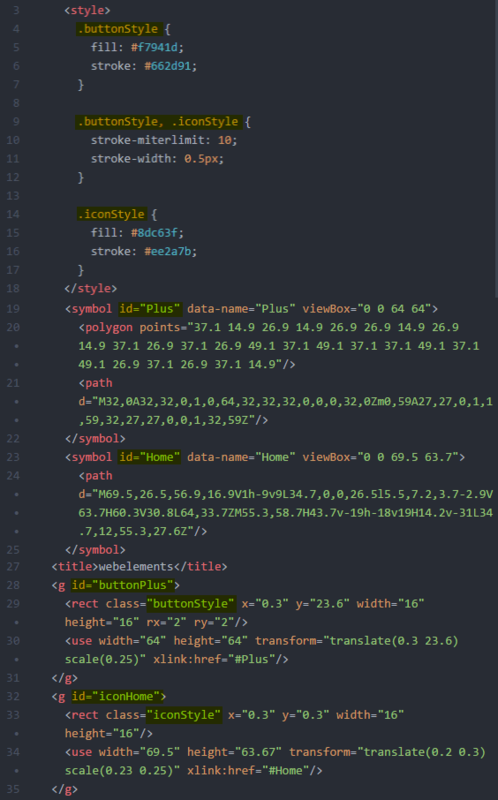 The second method is to use inline CSS styles (i.e. ). And the third method is to use SVG presentation attributes . In the image below, you can see the difference between these three options. If you want to convert your text to outlines, here you can instruct Illustrator to do so. If you want to preserve your text editability, then select SVG option. Outlined text gives you complete visual control of your typography, but at a significant cost – file sizes blow out and text loses editability and searchability. Note: SVG fonts will be removed from SVG 2 and is considered as a deprecated feature with support being removed from browsers. Here you can choose how you treat any raster images in your SVG. You can choose to keep them as external files, or to embed them into the SVG as DataURIs. Often Link is a useful choice as it makes the parent SVG file dramatically smaller and, as such, far more manageable in your code editor. However, the Embed option does have one great, overriding advantage: embedded images can never become unlinked/separated from their ‘parent SVG’. 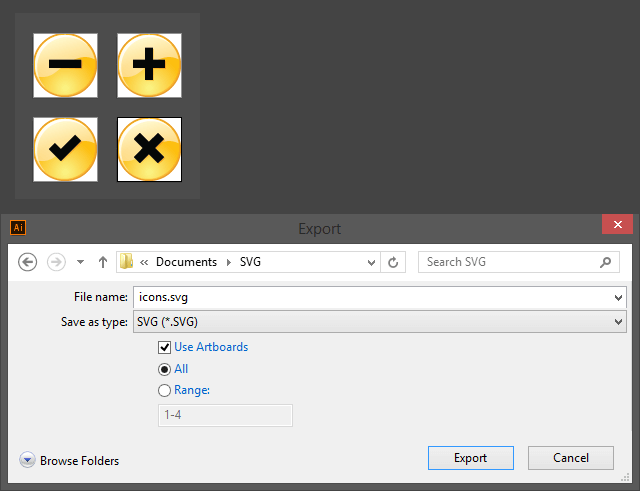 SVGs using linked resources will show the missing image icon the first time the SVG is downloaded, uploaded or moved without its ‘child images’. Keep this in mind if you require portability in your SVG. As a general rule, you’ll avoid many future headaches if you can simply avoid using pixel-based graphics in your SVGs whenever you can. 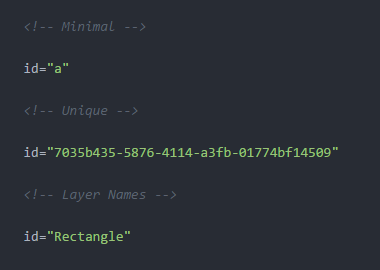 Generally the best option is to select Layer Names, because this will give you meaningful names for your individual SVG elements. Minimal uses random letter-numbers, and Unique uses large random combination of characters. This option defines how many decimal places your coordinates will have filled after the decimal point. Higher numbers means more precise paths, while lowest number produces less verbose code and small file size. As you can see from the graphic below, the path with 5 decimal places if far larger than the same path with 1 decimal – yet visually identical. Keep in mind that we’re talking about 100ths and 1000ths of a pixel here. Higher values will only ever be necessary only if your graphic is very small or requires incredible precision. In most cases, sticking to value of 1 decimal place – will be the best option. Check this option only if you’re exporting a final version of your graphic for production and you are sure that the file won’t be edited anymore. In theory, this option removes the width and height attributes from your SVG document – making it more responsive. However, in most cases, this is not enough to make your SVG truly responsive for all browsers and especially for IE. We’ll explore a fix for this problem in a follow up tutorial. TIP: It’s always a good idea to keep your original .ai file as your source, and then to export SVG copies with different settings from that parent file. When you choose Export As… command, in the appearing export dialog you may have noticed an additional option called Use Artboards. It becomes useful when you use multiple artboards—for example, when you create a set of icons—and you want each artboard to be exported as a separate SVG file. As you’ve seen above, a lot of optimization takes place during the creation and export of your SVG. However, you may want to further optimize your file with some specialized tool, such as SVGO or its web GUI-fied version SVGOMG. Be aware that you do need to be careful when using these tools. They can easily break your document functionality. My advice is to use manual optimization whenever it’s possible and use automated optimization tool only if it’s necessary and with caution. I don’t think I’m going out on a limb to pronounce SVG as the future of web vector graphics. It’s hard to see a situation where SVG doesn’t continue to gain more power along the time. If you haven’t dived in yet, it will be good and wise investment to start learn it now. We have SVG 2 appearing on the horizon with lots of powerful, new features to play with will. Exciting times ahead.